La Belle Saison: Enfin! Internet Connection! Fact of the Day: there are no floating sanitary towels in the Mediterranean Sea. None! 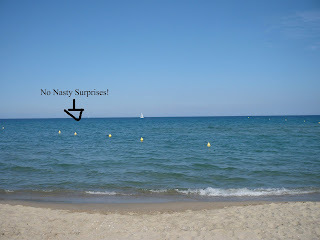 Unlike the sea that surrounds Britain, the Mediterranean Sea is transparent and sans feminine hygeine paraphenelia. And no fish either. Would you credit it? No scaley fish fins sweeping by your leg making you squeal and cry for your mum like a big eejit. I didn't think such a sea existed, but I have just come back from my summer holidays in Perpignan and you can take it from me kids, there are no floating sanitary pads of any sort in that sea. I even conjured up the balls to swim in said sea! Not just paddling but real swimming, like the backstroke and the doggy paddle and frolicks in the waves with a big tube ring! Pure brilliant. Ah yes, so, it has been almost a month since I last updated my blog but it's not from want of trying. Did you know that Versailles has no internet cafés? I mean what is that all about?! Anyway the nice little man from Neuf Telecom came and fixed us up with the necessary cable-age just before we left to go down South and it may be a tad pathetic but you can't imagine how relieved I am to have internet access again. FP has been rather chuffed too. It's been like Christmas in our apartment today. I shan't write much more today, I have lots of unpacking to do and after having been forced from my bed at 2am this morning to drive 8 hours across France, I am feeling a wee bitty sleepy. Eeeh and did I mention I have 381 of your blog posts to catch up on that are waiting for me in my google reader? Jeezo! yay for fabulous vacations! i'm so jealous that you were at the med...i freaking love it there, but i've been there via barcelona...still rather awesome! welcome back! It's scary how much we rely on that internet connection, huh? Hey..we're coming over to your area in less than a month! Can't wait! Good to see you back online - and you're looking fab, btw. Hello you beautiful bronzed lady! I was just thinking about you and wondering how your internet situation was coming along...we MUST meet up soon!!! Micah I'd LOVE to go to Barcelona, it's on my list of Places I Need To Go To! esa scary, it is! Aw man, holidays in Paris yay! Luckily you've been practicing your français! teuchter ahh it's good to be back, and thanks! Sam yes yes yes! We defo have to meet up, don't worry, it's prevu! I'll email you soon! Bis! Eeewwww ..... seriously sanitary pads in the ocean? Glad you headed to a much more pristine kinda beach!!! Looks lovely. Glad to see your back...not like I've been around too much recently either. Oh well. Nice tan, PE! Princesse you *must* go to Barca, it's just such a splendiferous place. Love your blog. Just returned from my year abroad for uni. I was in Versailles myself, working as an assistante. Loved it. Been feeling a bit deflated since coming home to Scotland, so your blog makes me feel a wee bit better and reminds me of my time there! Hoping to move back out to Paris next year, so fingers crossed! Bonnie Yes, yes. Sadly, yes. No wonder I have a phobia of the sea! Leah yay! I've missed you and all the other expat bloggers, I've needed moral support lately, thankk God for the net eh. Hope all is well petal! Lis I'm pleased to be back too! I'm not sure if I even managed to apologise to you and Jane for not having been able to meet up when you were in Paris. I was so gutted but the day fell on moving day. Hopefully there will be a next time? And the sunny face freckles, ah how I used to hate them! Learning to accept them has been tough! Tracy Hello! Oh I so know how you feel. I spent a year studying in La Rochelle and came home feeling rather - yes, deflated is a good word. Keeping fingers crossed for you, good luck!! There are floating sanitary pads in British seas??!! Anyway... you should also put Greece in your places "to visit", you will like the sea there too..
Pads? Expected en masse in yon Ocean? ...and I thought I had an irrational fear of sharks. Seriously...you've actually seen schools of pads floating by?